The courthouse casts a large shadow–so large sometimes it dwarfs those who pass through its doors. 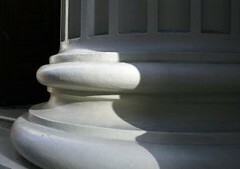 So mighty is the institution we call the law, so lofty its traditions, that we can lose our sense of scale: in the grandeur of the marble columns, the weight of precedent, it is easy to forget that the halls of justice were created to serve human beings. Now comes a blog that seeks to give voice to the crowds that climb the courthouse steps. Published by Tracey Broderick, In This Case allows ordinary people to describe their experiences with the law. If you have a story for this blog, let Tracey know about it. She’d love to hear from you. And let’s wish her the best of luck as she uncovers for us these stories about human life and law. This entry was posted in Blogs and Bloggers, Lawyers, Law and Justice. Bookmark the permalink.